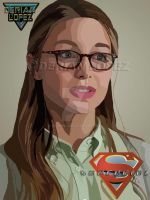 God I have a love/hate relationship with the Supergirl TV series. one of the aspects I hate is the love triangle, Now I hate love triangles at the best of fiction but I really hate it when a story makes one between the Hero, the love interest, and the Villain( or Villains if you want to count Lucy Lane ans a love square) because it's suppose to force the audience on where to ship the characters and well it didn't work on BBCs Robin Hood and it's in my eyes not working here Now before anyone accuses me of being racist I like James and Lucy I mean the only problem they seem to have is Him getting annoyed that she makes gay for Superman jokes about him and really having him hook up with Kara will not help his case. But I'm getting off track a week ago I was on io9.com where they had an story saying that Supergirl and her boss Cat Grant have the best chemistry on the show and made the statement that they should pull a Legend of Korra and ditch the love triangle and have Kara and Cat hook up and honestly I think they should. I've found that the shippers of this call it SuperCat or KaraCat personally I vote to call it Streaky after the Supercat in the silver-age Supergirl comics. The only pairing I'm really for is Kara/Adam (and it really threw me for a loop finding out that the performers are married in real life). That said, this is a cute picture. Must take quite a bit to make Cat smile. Not to be prude or anything, but if they do that, the family friendly aspect of this show goes OUT THE WINDOW. Oh and that would very much anger Islamic extremist Muslims...they kill homosexuals and absolutely DEGRADE women! Love triangle...GET RID OF IT! Here in the states CBS has soap operas already, albeit two as the genre of soaps on TV is dying (Young and the Restless and Bold and The Beautiful). As you mentioned Streaky, I think that cat should be in the show...just no superpowers. I mean have the cat, with a streak along the side (even if it's painted on and provided the make-up does not harm the cat), just don't expose him/her to any kryptonite. 2. as you point out Soap operas are dying. My point in the argument is that love triangles with hero and potential villain is bad story telling because the potential audience could a) be deluded enough to say She could change him no matter what the villain does or b) feel that the girl doesn't need to be with ether man.